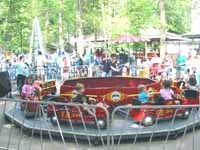 Knoebels has enough Kiddie Rides to keep your youngest child busy for days. 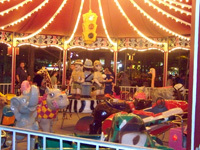 Our kids, when babies, started with the small rides like the kiddie carousel, Fire Trucks and Spanish Bambini. 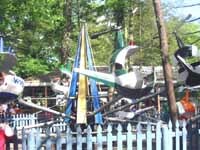 As they grew older they moved on to some of the "flying" rides like the Helicopters and Jet Skyfighters. Even today as a young teens they still like the Panther Cars. 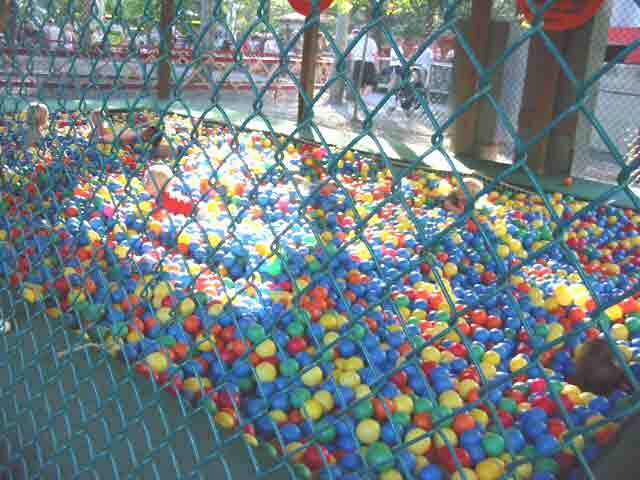 Ball Crawl - This is a GIANT ball pit where kids can swim in a colorful sea of balls. Cub Cars - These are low-speed electric go-carts provide young drivers their first driving experience without the guidance of a fixed track. 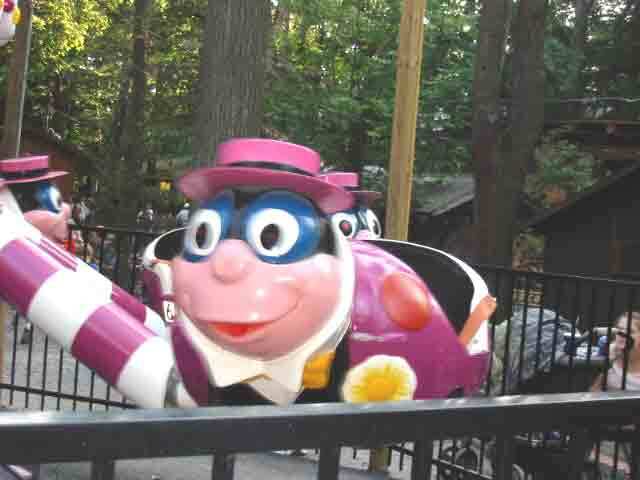 I feel bad for the operators of this ride, because at this age the co-ordination needed to keep the car going in the right direction is still being developed. Although the kids are having a great time!!! Fire Trucks - Who doesnt want a chance to drive a firetruck? Flying Tigers - Colorful airplanes swing out and round the corners of their flight path. Ride action simular to the whip. 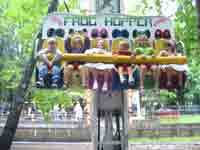 Ribbit - A recently installed ride it has become a quick favorite, hear them "ribbit" as the ride bounces up and down. Goin' Buggy - Youngsters sail on the back of colorful ladybugs. 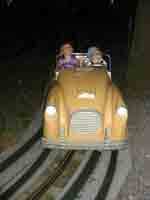 Hand Cars - A "kid-powered" ride. (think hand cranked rail car) you crank a cart along the miniature train tracks? 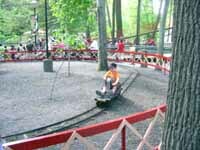 This can be a tough ride for some of the smaller kids without lots of arm strength. 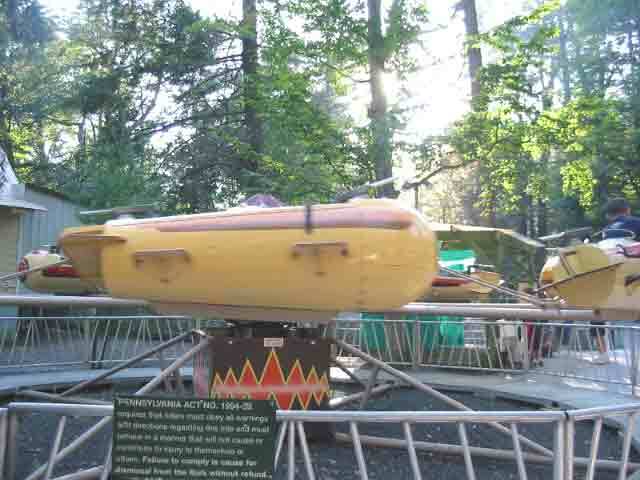 Helicopters - Pilot a Knoebels police or medical helicopter! It's your choice, you get to move the ride up or down. 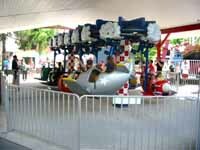 Jet Skyfighter Ride - Fly the rockets and soar above Kiddieland. A favorite of my kids. 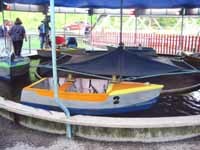 Kiddie Boat Ride - A traditional favorite, dont forget to ring that bell! Classic boats around a circular sea. 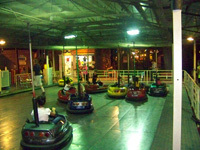 Kiddie Bumper Cars - Young drivers control their own bumper cars just like Mom & Dad, Again directional control can be a little frustrating to the kids, but for the most part they have a blast! 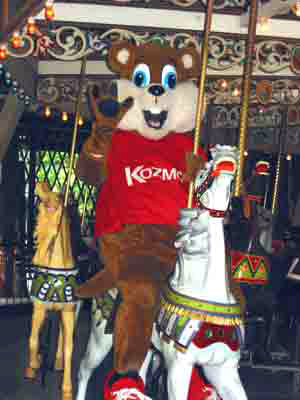 Kiddie Wheel - Just like Knoebels Giant Wheel only smaller. Kiddie Whip - Just like the classic Whipper this scaled down to a kid-sized adventure give all the thrills of the full sized one. 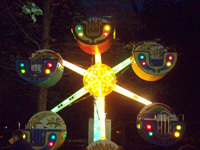 My kids LOVED this ride and would run off to get right back in line. 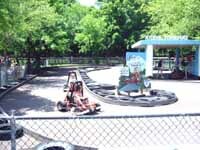 Panther Cars - Another of my kids favorites, a beautiful tree-lined track where the kids get to "drive" their own car. 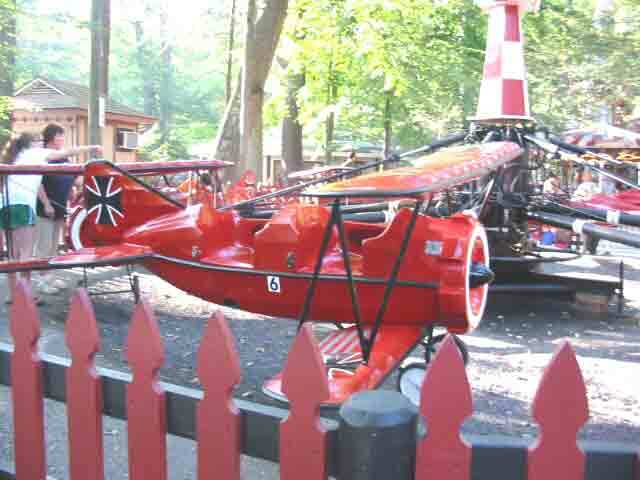 Red Baron - Fly your own "Red Baron" biplanes above Kiddieland. Watch out Snoopy these kids are ruthless! 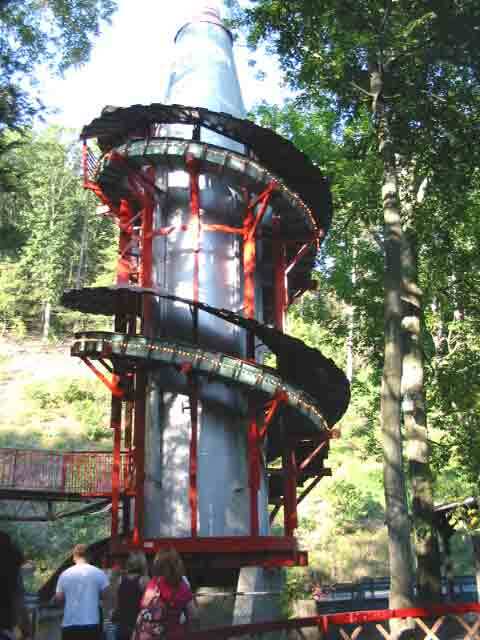 Sky Slide - Slide around and around the outside of this giant rocket ship from the tiptop all the way down to the ground. 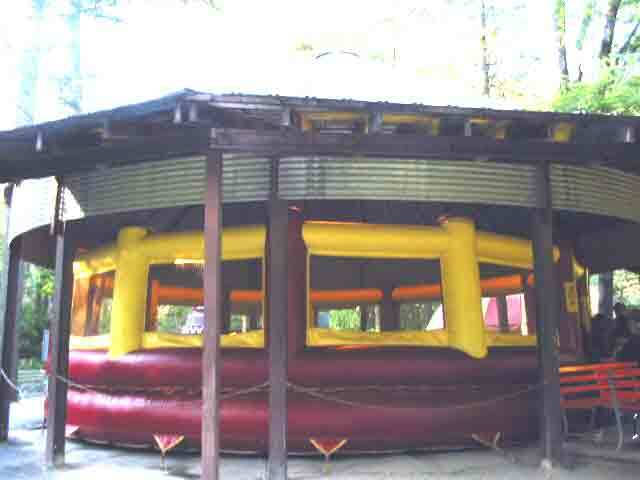 Space Walk - Your typical inflatable jumpy. 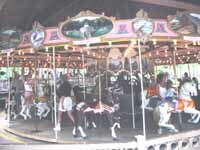 S&G Merry-Go-Round - A classic Stein & Goldstein (c.1910) portable carousel with scenery panels show landmarks from surrounding communities. Spanish Bambini - My daughters absolute favorite (she still wants to go on whenever she can) Riders can choose from tractors, trucks, and jungle animals for their ride adventure. Umbrella Ride - Its like the Fire Trucks only its dune buggies.